You've decided to take the first step and purchase a BlackBerry smartphone. You've setup your e-mail, installed some applications and themes, used it for a few days and suddenly find that it's acting funny. Maybe it's not working as fast as before, the internet is stalled, or application memory is gone and nothing has been added. Is it possessed? Do you want to hurl it against the wall? Before exchanging the device or panicking that it's broken, know this. It's normal; from time to time, your device might become slow and unresponsive. There is a quick and simple way to troubleshoot these issues. In these cases, it's necessary to reset your BlackBerry device by performing a hard or soft reset. A hard reset is also called a battery pull. Essentially, a battery pull restarts the operating system on your BlackBerry device and is just like rebooting your PC when it's experiencing problems. It is not the same as using the Pwr Off/On button. This only places the phone in standby mode. Not only does a battery pull solve various problems with your device, it also frees up application memory and shuts down applications running in the background that can drain battery and resources. Bluetooth errors – connecting, pairing, etc. LED Notification - LED keeps flashing when there are no new e-mails, texts, alarms, etc. A hard reset is when you manually remove the battery from the device while it is powered on and reinsert it after 30 seconds. This will involve removing any case you are using and the battery cover. After a few moments your device will start to reboot the operating system. If you have OS5 or OS6 you will see a progress bar and a black background that shows the BlackBerry name and logo. Earlier systems will show a white background with a blinking hourglass. Your phone can take anywhere from one to five minutes or possibly more to reboot depending on your OS and the applications you have installed. This is completely normal. A soft reset does not involve removing the battery but rather pressing three keys simultaneously on the QWERTY keyboard - similar to pressing Control-Alt-Delete on a Windows computer. However, devices that utilize SurePress ™ and SureType ® (BlackBerry Pearl and BlackBerry Storm) cannot perform a soft reset and will require downloading a third-party application to simulate one. A soft reset is useful when you do not want to go through the whole procedure of removing the case/cover to access the battery. 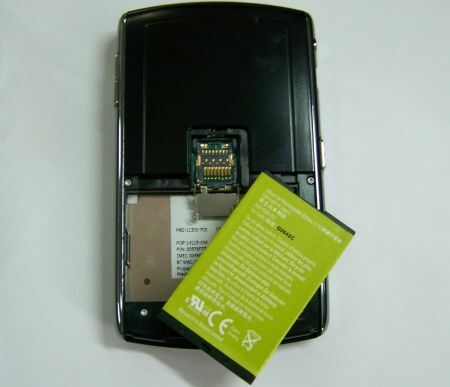 Some hard shell cases do not last if constantly taken off and put back on. 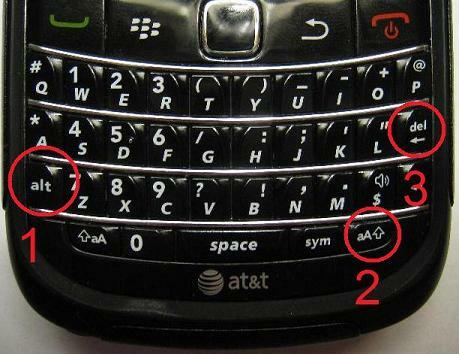 Some BlackBerry users often discuss the double soft reset and how it comes closest to substituting for a hard reset. To perform, you will first need to do the standard soft reset. The red indicator light will appear and the screen will go blank. When the screen is no longer blank, press the keys again (perform another soft reset). You should then see another black screen followed by an hourglass (on earlier models) or the progress bar on OS5+. Third-party applications make simulating a battery pull extremely easy, especially for those of you who want to avoid accidentally breaking the cover, pressing the wrong button combinations, or to just prevent breaking a nail. Just one click allows you to reset your device. The following are a few of the free and paid applications available from both the CrackBerry App store and BlackBerry App World. QuickPull by Steelthorn Software. This is available for free the CrackBerry App Store at http://software.crackberry.com/product.asp?id=27660&n=QuickPull-5. QuickPull recently updated their application to version 5.0 making it compatible with all devices running OS 4.5+ including the Torch and Style. RestartMe by S4BB Limited. A free application from the CrackBerry app store that is currently available for all devices running OS5 and older. http://software.crackberry.com/product.asp?id=74701&n=deReset---The-Effective-Device-Reset-%2F-Restart-App and is compatible with all BlackBerry models using OS 4.6 and higher including the Torch. A free trial is also available. There you have it - the when, why and how of the battery pull. Resetting your phone is just one of the many ways you can keep your device running like new and to solve many of the minor problems you may have.